Hany Abu-Assad (Arabic: هاني أبو أسعد‎; born 11 October 1961) is a Dutch-Palestinian film director. He has received two Academy Award nominations: in 2006 for his film Paradise Now, and again in 2013, at the 86th Awards, for his film Omar. Abu-Assad was born to a Palestinian family, in the city of Nazareth, Israel in 1961. He immigrated to the Netherlands in 1981, where he studied aerodynamics in Haarlem and worked as an airplane engineer for several years. Abu-Assad was inspired after watching a film by Michel Khleifi to pursue a career in cinema. Abu-Assad initially started as a TV producer working on commissions for Channel 4 and the BBC. He founded Ayloul Film Productions in 1990 with the Palestinian film-maker Rashid Masharawi. In 1992, Abu-Assad wrote and directed his first short film, Paper House which was made for NOS Dutch television and won several international awards at film festivals in Paris and Jerusalem. In 1998, he directed his first film, Het 14de kippetje (The Fourteenth Chick), from a script by writer Arnon Grunberg. Later films include the documentary Nazareth 2000 (2000) and the feature film Rana's Wedding (2002). In 2006, his film Paradise Now won the Golden Globe for Best Foreign Language Film, and received an Oscar-nomination in the same category. In 2005 Paradise Now won the Golden Calf for best Dutch film. His 2013 film Omar was screened in the Un Certain Regard section at the 2013 Cannes Film Festival where it won the Jury Prize. In 2014, Omar was the Palestinian entry for the Best Foreign Language Film at the 86th Academy Awards, and was nominated for the award. The film also won the award for Best Film at the Asia Pacific Screen Awards. In 2014, Abu-Assad was invited to join the Academy of Motion Picture Arts and Sciences. ^ "Hij wil gaan en hij gaat ook". NRC Handelsblad. 20 February 2006. Retrieved 26 January 2014. Hany Abu-Assad heeft een Israëlisch en een Nederlands paspoort, hij woont tegenwoordig in Los Angeles, maar, alle relativeringsvermogen en zelfspot ten spijt, hij is en blijft een Palestijn, geboren in Nazareth. ^ a b "Palestinian filmmakers long for home". Variety. December 17, 2011. Retrieved 2014-02-19. ^ "Oscar nominee: People hate Israelis for a reason". Ynet. February 3, 2006. Retrieved 2014-02-26. ^ a b "Palestinian movie, partly filmed in Israel, gets Oscar Nod". Times of Israel. January 16, 2014. Retrieved 2014-02-19. 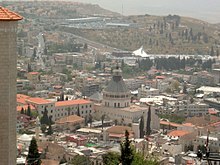 ^ "Oscar-nominated 'Omar' shines spotlight on film mecca of Nazareth". The Christian Science Monitor. March 2, 2014. Retrieved 2014-03-02. ^ "Hany Abu-Assad". International Film Festival Rotterdam. Archived from the original on 2014-03-08. Retrieved 2014-03-02. ^ "Hany Abu-Assad - Biography". San Francisco Jewish Film Festival. Archived from the original on 2015-05-18. Retrieved 2015-05-13. ^ "2013 Official Selection". Cannes. April 30, 2013. Retrieved 2013-04-30. ^ "Cannes: 'The Missing Picture' Wins Un Certain Regard Prize". Hollywood Reporter. 26 May 2013. Retrieved 2013-05-26. ^ "APSA Nominees & Winners". Mendes, AC (2015). “Walled in/walled out in the West Bank: Performing Separation Walls in Hany Abu-Assad’s Omar”, Transnational Cinemas, 6.2, 123-136. Provan, Alexander (2006). "The Humanist in Hany Abu-Assad". SOMA Magazine (October 2006).